Wedged in between a clinic and a provision shop at Block 632, Yishun Street 61 is what appears to be a run-of-the-mill neighbourhood math tuition centre. But step inside and you might be surprised by the Russian man writing equations on the board. 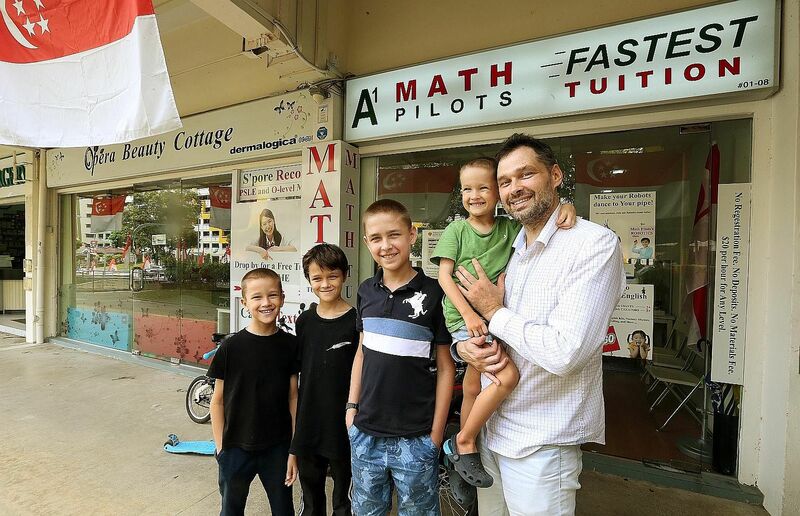 The heartland tuition centre, Math Pilots, belongs to Dr Alexander Kuznetsov, 46, who moved to Singapore in 2014 with his wife and four sons, aged five, eight, 11 and 12. The centre started out with his own children, then grew to 60 students within four months of its opening and now has 200 tutees. Said provision-shop owner Pow Siew Choo, 60: "I've been here 30 years. This is the first ang moh to set up shop in our neighbourhood. "He was operating at a small unit leased from a beauty salon, but his business has been so good that he now has two units to himself. Our grandchild studies with him." Dr Kuznetsov bought out the beauty salon in July and leases the space from the Housing Board. The centre is now operating at full capacity, so he has closed admissions. Armed with a PhD in maths from the Moscow Institute of Physics and Technology and a master's in psychology from Moscow State University, he moved here to forge a new life for his family. They have applied to be permanent residents. He said: "I want my children to grow up in a friendly and safe environment. In Russia, my children can't walk about freely; they might get kidnapped or robbed. "There, many people have an aggressive, tense and stern expression on their faces. I wanted something different for my children." He decided on Singapore because of the culture here. "People are friendlier, they smile much more, and the streets are safe for my children," he said. "I have four sons who will be ready for national service when they turn 18." In preparation for his big move, he developed a business plan and pumped in $200,000. "My strength is in child psychology and math. With my skills, I believed that I could contribute to Singapore's education scene. Of course, it was scary at the start, not knowing whether the centre would take off," he said. He also had to study the local math syllabus. Laughing, he said: "Initially, I could only solve questions using higher math techniques. But I needed to be able to explain solutions to students according to the Ministry of Education curriculum." He has since put two Singaporeans on the payroll as tutors for the centre. He has dreams of establishing an international school here, and he is currently negotiating with investors. And just as the Russian had to adapt to being a tuition teacher in the heartlands of Singapore, his customers likewise had to come around to the idea of going to a Caucasian tutor with a slight Eastern European accent. Homemaker Katherine Tan, 43, sends her son, who is in Primary 1, to Dr Kuznetsov. She heard about his centre from a friend. She said she was not sure what to expect at first, and wondered why a Russian would set up an enrichment centre in Yishun. She said: "I've since learnt that he's genuine. My son loves going to him because he is a patient teacher. He even has tips on how to manage my child's behavioural problems." As for his own children, Dr Kuznetsov has decided to get a head start on the major exams. The eldest son, Ivan, now 12, earned a B grade for completing his Cambridge International Mathematics secondary education exam when he was nine. Meanwhile, his eight-year-old brother does Secondary 3 math and the 11-year-old is tackling O-level subjects. "I'm speeding up their education so they can be free from it and can start pursuing their own dreams and goals," said Dr Kuznetsov. His wife, Ms Tatiana Dyagileva, 35, is furthering her drama studies back in Moscow. The Kuznetsovs have become familiar faces in the neighbourhood. "We are very famous here, but some people mistake us for French, and say bonjour (hello) to us. Do I sound French?" Dr Kuznetsov asked with a chuckle. Ms Pow said: "They always say hello and are very down-to-earth. They cycle from home to the centre to save money." Dr Kuznetsov said his bond with his neighbours at Block 632 started from day one. "The clinic and the provision-shop owners allowed me to place my tuition centre leaflets at their premises." When he moved from his apartment in Orchid Park to Northwood Condominium, Ms Pow's family lent them a car. Apart from teaching math, Dr Kuznetsov has taught his children some Singlish so they can socialise. Eight-year-old Michael said: "We know 'ya lah' and 'jalan jalan'." The boys also enjoy chicken rice. Their father said: "We're so pleased to be here in this neighbourhood. We're surrounded by good people."